I had one of those nights that I had no idea what to cook, so I looked in the pantry to see what ingredients I had. 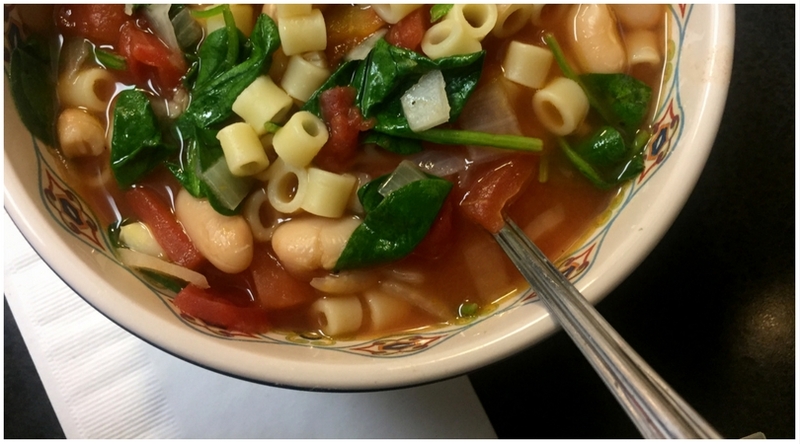 I had broth, ditalini pasta, cannellini beans… “SOUP!”, my brain said. So I ran to the grocery store to get a few other things and this magically flavorful cannellini bean soup happened. It was too goo not to share, so here you go! Sautee the garlic and onion in 2 TBSP of EVOO and salt. Boil water in a separate pot for the pasta. (Cooking the pasta separately keeps it from absorbing too much of the broth when you store it.) 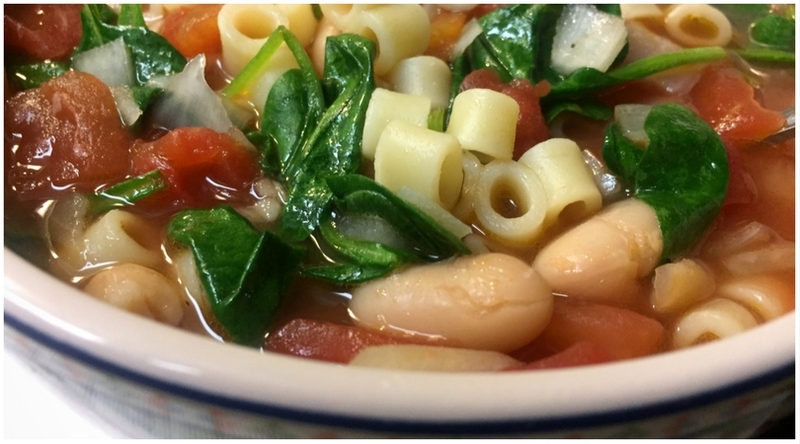 Once the garlic and onion is aromatic, add the veggie broth, tomatoes in their juices, and cannellini beans. Season to taste with salt and pepper. Let this simmer for 15 minutes, then add the spinach. Allow it to wilt. Once the pasta is done, drain, rinse and add to the pot of broth. This makes 6-8 servings, so it’s perfect to use as a meal prep recipe for an easy lunch or quick dinner! If you make it, please let me know! I’d love to know what you think. If you post a pic, make sure to tag #NurturedKitchen. ENJOY! Mmmm this looks tasty and perfect for cooler Fall temps. I use cannellini beans in a few recipes, the family likes them a lot. it is so chilly out here today! This would be perfect! You had me at easy recipe. I love easy recipes perfect for weeknights. Great looking soup!! I love a good soup, especially in the fall! I think both my husband and myself would really love this! Yum! I cook dinner for my grandfather and he ALWAYS wants soup. Pinning now because I will definitely try this one out! Ooh, this looks delicious and so colorful. It’s a perfect comfort food for cool fall weather. This is the perfect soup for the chilly days that will be approaching. I love to sprinkle some Italian cheese on top of it. I will certainly be eating this soon for lunch and dinner. Love this soup with the beans, perfect for this cooler weather we are having! I’m on the lookout for recipes with spinach as my doctor said it’s very good for my unborn baby! This would be perfect for a cold fall night – will definitely be saving for later. It’s the perfect time of year for soup! I love that you can add in whatever you have on hand. 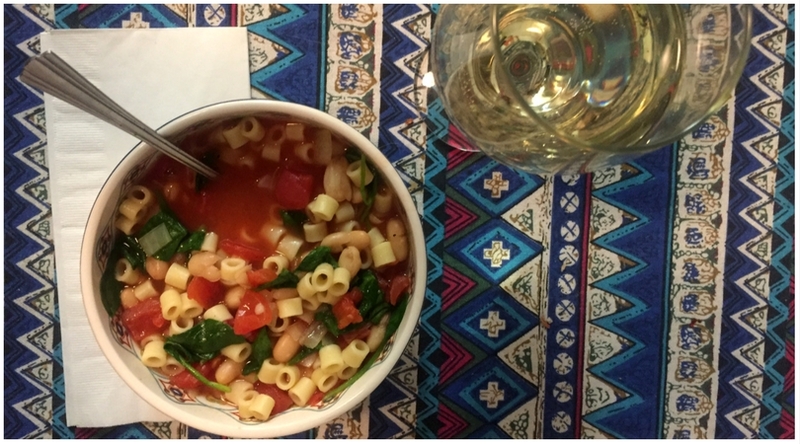 Your cannellini bean soup will be delightful…and delightfully easy to make! This looks so delicious! I have been making soup weekly and this would be a fine addition to the line up. I love ditalini and this looks delicious, not to mention perfect for this time of year. Thanks for the new recipe.